On January 1, 2012, at 12:56 PM, I published my first article on this blog. If you merely look at the status quo in the NHL you may not think much has changed. But I believe that over the past 24 months there has been tremendous progress in removing fighting from hockey. January 2012: Brian Burke holds a press conference to announce he is sending Colton Orr to the minors and utters the now famous rallying cry, “…if we don't have guys looking after each other then the rats will take this game over.” Most media outlets offered opinions that the Leafs should focus on skill and that Burke was a dinosaur. January 2012: At a summit of junior hockey leagues (OHL, WHL, QMJHL and USHL) several new rule proposals were discussed that would limit or eliminate fighting at this level. February 2012: An organization known as The League of Fans (founded by Ralph Nader) publishes an open letter to Gary Bettman suggesting that he bans fighting in hockey. Although fight-fans made fun of the letter it did get considerable media attention and demonstrated that there was lots of focus on the issue by outside groups. March 2012: OHL announces new rule changes that will put fight limits on players with escalating suspensions when those limits are exceeded. QMJHL and WHL state they are not following their lead. of violent hits and brawling. Fans and media alike call for referees to take back control of the game. NHL advertisers and sponsors call the league and ask what is being done to clean up the sport. May 2012: Don Cherry, in a Hockey Night In Canada broadcast, calls for the removal of the instigator rule so that players can clean up the sport. It prompts several well written articles from media veterans that details just how violent hockey was before the instigator penalty was added to the rule book. NHL ends with a fight per game ratio of .44, down from .52 in the previous season. OHL ends at .94, down from .99 in 2010-2011. WHL ends at 1.01, down from 1.09 in 2010-2011. QMJHL ends at .79, which was identical to 2010-2011. September 2012: Junior hockey organizations in Canada and the USA all announce rule changes that are intended to reduce fighting in their leagues. March 2013: Frazer McLaren knocks David Dziurzynski unconscious and touches off the fighting in hockey debate. In my totally subjective analysis, based on the comments on the various media articles covering the event, it appears that support for banning fighting is 50:50. NHL ends with a fight per game ratio of .48 in the strike-shortened season, up from .44 in 2011-2012. OHL ends at .72 versus .94 in 2011-2012. WHL ends at .85 versus 1.01 in 2011-2012. QMJHL ends at .68 versus .79 in 2011-2012. August 2013: At their annual meeting the Canadian Medical Association voted to condemn the complacency of NHL team owners and launch a communication program to bring about an end to fighting in hockey and reduce brain injuries. 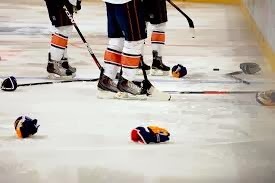 September 2013: NHL adds several new rules that are expected to curb fighting, including the new visor rule and forbidding players from removing their helmets during a fight or they will earn an additional minor penalty. October 2013: George Parros is carried off the ice on a stretcher as a result of a fight with Colton Orr. The fighting debate, already well covered beginning with the NHL pre-season, grows exponentially and doesn’t go away. A few General Managers and several former players come out in support of a fighting ban – something that would have been unheard of just a few years earlier. November 2013: Ray Emery skates the length of the ice and engages an unwilling Braden Holtby in a fight. The fact that he escapes without suspension prompts wide spread ridicule of the NHL’s support of fighting in the game. Media question how the Department of Player Safety can allow two players to punch each other repeatedly in the head without major sanctions. December 2013: Shawn Thornton attacks Brooks Orpik in an incident that is too similar to McSorley on Brashear or Bertuzzi on Moore. Fight fans try to separate the assault from the role of enforcers but you can’t separate the intent from the result. 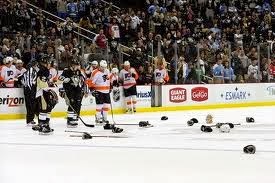 Media, hockey fans and even players question why hockey hits have to be answered with a hockey fight. December 2013: USHL announces that they intend to add a game misconduct for any player engaging in a fight. The new rule will be discussed at an upcoming general meeting and, if they get a majority vote, will be implemented for the 2014-2015 season. December 2013: Hockey Canada, which oversees junior hockey in Canada, states that they will discuss a game misconduct penalty for fighting at their Annual General Meeting in May. NHL at .44 versus .48 in 2012-2013. OHL at .72 versus .72 in 2011-2012. WHL at .90 versus .85 in 2012-2013. QMJHL at .74 versus .68 in 2012-2013. Even after 79 posts (including this one) and some 45,000 page views, I can’t take any credit for the changes in rules and attitudes noted above. I wouldn’t have to remove my shoes to count the number of individuals that I converted to anti-fighting advocates. But my objective when I started was not to become an evangelist or a catalyst. When I decided to start this blog I was under-employed and motivated by a then recent piece in the New York Times on Derek Boogaard. My objective was to speak out on an issue that I had always felt strongly about and to present an alternative view of the impact of fighting. Hopefully in some modest way I have presented facts that dispel the popular myths of “momentum changing” and “policing”. I have tried offer a different view of the history of fighting in the game, of “The Code” and how enforcers affect the image of hockey. I’ll continue to add my voice to the debate in the hope that the NHL will soon implement a game misconduct for any player who engages in a fight. Then I can retire and go back to simply watching a game that focuses on hard hitting and skill. Great job Paul. Keep this up! The level of constant fighting is a stain on professional North American hockey. I sure hope they make it a game misconduct to fight. Sure there will be the occasional fight but it should not be an expected part of the game. A nice and amazing blog on the not part of the game.Thanks for the blog posting.